When I hover my mouse over a variable when debugging a C# app in Visual Studio nothing popups. I expect to see the value of the variable (aka datatips). I'm running Visual Studio 2012 Ultimate (trial edition) on Windows 7 64bit. Does anyone know what may prevent them from showing? 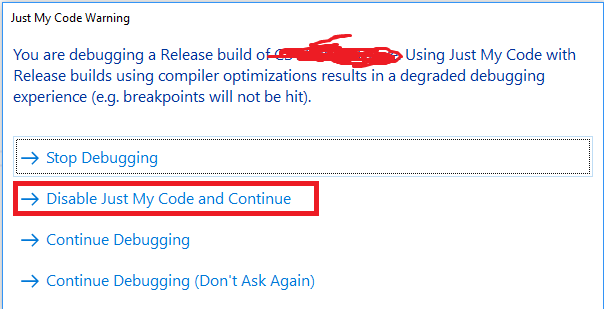 I can see the datatips correctly with the same C# project on Windows 8/64bit with the same version of Visual Studio. THis helped me: you need to open in VS Tools | Options | Debugger | General and enable the flag [Use Managed Compatibility Mode]. Before running the application check you are running it in Debug mode. If set to Release mode change it to Debug and then run. The debugger will then provide the data-tips. I had this problem so I deleted all the *.suo and *.user files I could find in the solution directory and that seemed to fix it. I had this same problem. My project had somehow gone into Release mode, so I changed it back to Debug mode via Build|Configuration Manager and it was working again, the datatips reappeared. the same happened to me but only with C#, active mode administered compatibility (Managed Compatibility Mode) and it worked well, then I wanted to modify the code while had debugged and came out a motioning message "compatibility mode administered is not supports edit and continue" then turn it off again, under native support is (Use the legacy C# and VB expression evaluators) enable this option and you can see the value of objects and edit code debugging. This 3 combinations solved it for me. - Make sure Enable Just My Code is checked. Using remote debugging on another machine makes it more challenging. Remote Debugging not working. "Unable to attach to process. The RPC server is not available." Native compatibility had the same effect. It was only "Use legacy C# and VB expression evaluators" that allowed hover over variables AND remote debugging in my case. If you are facing this issue simply uninstall the current version and reinstall VS. After installing and running debugging mode first time, please choose "Disable Just My code and Continue" selection,it should work. (as shown in the attached screen shot). after this simply start debugging and choose "Disable Just My code and Continue" option. Not the answer you're looking for? 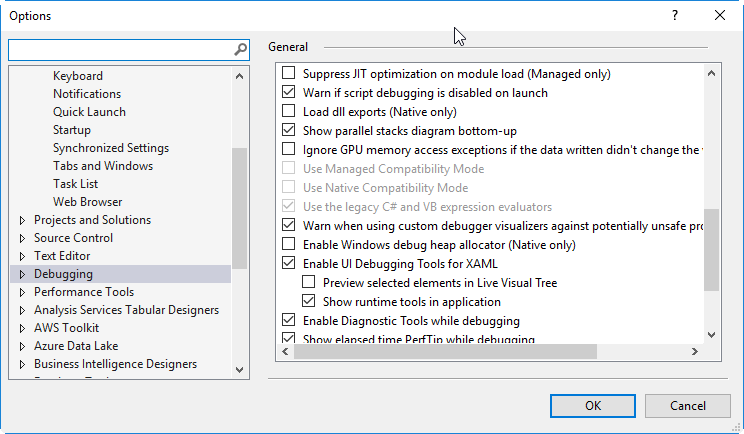 Browse other questions tagged c# visual-studio debugging visual-studio-2012 or ask your own question. Hover Tooltip stopped working in Visual Studio 2012 Express for Web? Can I see datatips in Visual Studio (vb.net) when I hover over variables in a With block?